This photo shows the New York Herald Building, located in New York City at Broadway and 34th Street. It was built in 1895 and demolished in 1921. It is located in an area called Herald Square, named for the newspaper of the same name, which was acquired, in 1924, by the New York Tribune to become the Herald-Tribune. (Times Square, about eight blocks to the north, was similarly named for the New York Times). Many people know this area as the location of Macy’s flagship store and where its annual Thanksgiving Day parade ends its route. 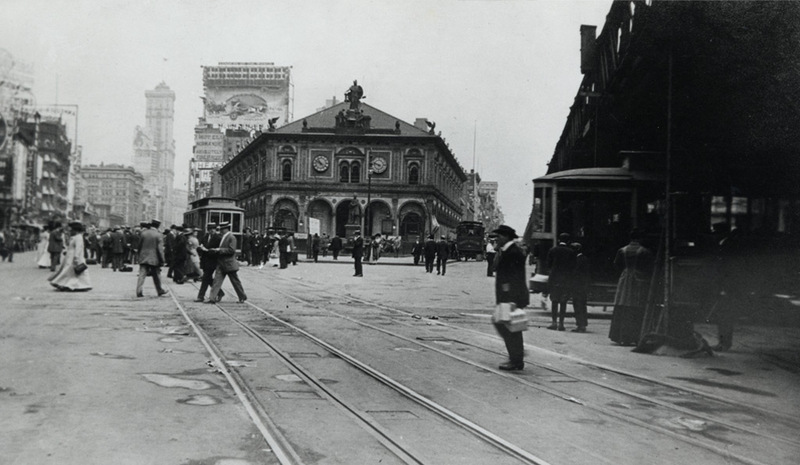 Herald Square, where this photo was taken, is about 3 miles north of the Hudson Terminal Buildings (at 30-50 Church Street) in downtown New York where AEP headquarters was located for 52 years, beginning in 1909. AEP relocated its headquarters in 1961 to 2 Broadway, a little south of its former location. Not many AEP employees are aware that the buildings at the previous location on Church Street were torn down to make way for the World Trade Center, which was destroyed on 9/11/2001.